Secret Warehouse LONDON anounced 24h before event. 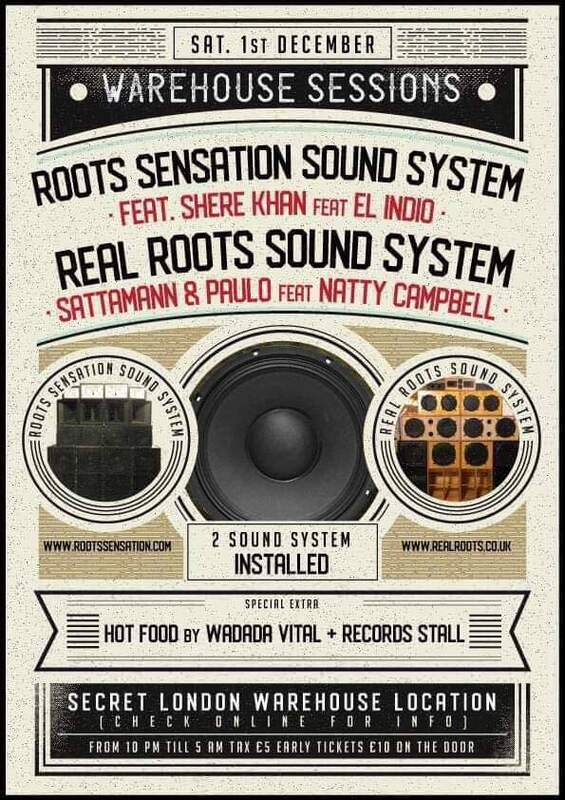 2 of London’s heavy weight roots reggae handbuilt soundsystems! Venue: Secret NORTH LONDON Warehouse – announced here 24h before event. ✧ A good stock of vinyl for sale. 2018 sees the launch of his traditional heavy weight Sound System and this session sees/hears it in its entirety, 4 scoops and everything up, towering up!! Bass full, sirens and all! Rob Roots Sensation producer, label, sound system. Shere Khan has been learning and absorbing information from the great Channel One Sound for the last 4 and a half years. He has also been selecting tunes weekly on London’s LIFE FM for nearly 5 years and currently works at Dub Vendor Records. Launched in 2016! A traditional hand built, 4 scoop, pre-amp run analogue system. Strictly vinyl, strictly roots. Run, operated by Sattamann & Paulo! Joining them for this session is MC Natty Campbell.